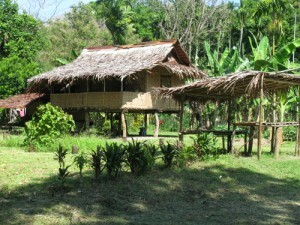 Traditional huts were built using natural materials like coconut tree leaves. Built off the ground, the huts would remain dry, and let the breeze carry the heat away. Coconut tree provided sustenance, a cash crop for sale, timber, leaves for use... 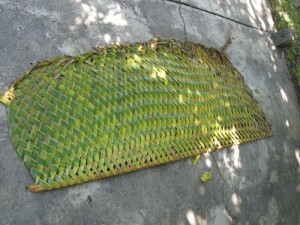 This place mat was woven from a coconut tree branch and its leaves. The weaving of coconut leaves created intricate patterns. Almost all of the visitors displayed the reddish orange stain of the betelnut chewing habit on their teeth and lips. Betelnut was the fruit of the Areca palm, collected in bunches like grapes. The nut was green on the outside, about twice the size of a large elongated acorn. There was not a shell to break, but instead a thick skin to bite through. Working past a fibery husk, one reached the peanut sized core of the nut, which was not crunchy as an almond or a walnut, but soft with the consistency of cheese. By itself it was dry; it almost made the saliva glands soak the moisture back out of one’s mouth. Betelnut was chewed together with "mustard" and "lime." What they called mustard with its sharp taste, was the pencil like long seed pod of a vine. Its local name was "daka" in the family of the kava plant. They would dip the mustard into a small medicine bottle containing the white powder called lime. 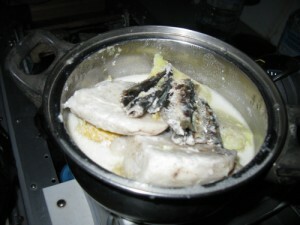 Lime was prepared by baking sea shells in a fire, picking the white remains, then grinding it. Calcium carbonate was the actual ingredient. 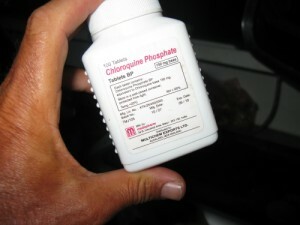 About as attractive as the chewing tobacco habit in North America, the product of this unlikely three part cocktail was a bright red saliva, which had to be spit out constantly, leaving red stains all over the pavement, or where people sat in the shade. One could always tell where people had been hanging out... It was an addictive stimulant, perhaps much like the coca leaves chewed in South America. I have heard comparisons of its effects to caffeine, or to nicotine. Even though the habit results in stained teeth, there is a claim that it strengthens the enamel, preventing the cavities from forming. A conflicting claim is that it causes mouth cancer in the long run. Betelnut has been in the local culture for a long time. Free market supply and demand principles determined the price of each nut, increasing when there was a shortage, dropping when in abundance. When I asked him about the betelnut, Philip explained that when guests arrive at one’s home, traditionally they would be offered the betelnut first, then everyone would drink tea. Betelnut seemed to be a part of the landscape, a part of the PNG experience. On Tuesday morning, on February 10th, Pastor Moses and Eva came by my boat to accompany me to the Newsland Phonic Elementary School. The school was near their village, a kilometer by walking I was told. Certainly I could manage the distance even with my injured back. 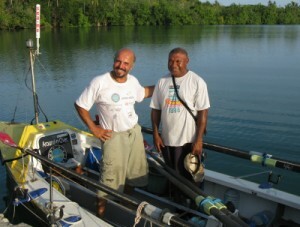 We wanted to be back at the latest by mid afternoon so that I could prepare my rowboat for tow behind the cargo ship UMBOI. We hoped that we could hitch a ride on vehicles on the dirt road leading to the Kamlawa village and the school. The walk proved to be much longer than I had imagined. As I walked, periodically my lower back would bind up, the muscles would contract, my left buttock and hip flexor would start aching, my left shin would start tingling, forcing me to stop in the shade of a tree, to crouch and stretch. These were the sciatica symptoms which worried me; at the same time, I had full strength of my left foot and I had been able to identify the injury mechanism which had caused this problem. I had confidence that given time, I would recover. The few vehicles that did pass, did not bother to stop. We crossed a bridge over a small river just before the Kamlawa village where Pastor Moses pointed to a small protected beach. That was where they had launched their dugout canoes to check on me on February 4th. At my pace, the walk was proving to be slower than anticipated, the sun was getting hotter, we were feeling the effects of the oppressive humid heat. The relatives at the Kamlawa village were kind to fetch us young coconuts, for their refreshing juice inside. Eva’s mother and cousins also lived in that village. I could see all around me the traditional huts built up off the ground using materials readily available. Coconut tree trunks became the stilts which lifted the floor off the ground. 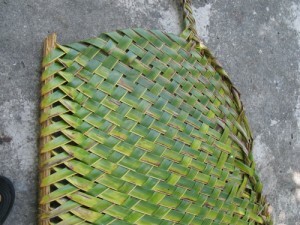 Coconut tree leaves provided the raw materials to weave the side panels, and to cover the roof against rain. The raised design of these huts made them cooler by letting the wind pass under, kept moisture out, also reducing the chances of animals and critters getting inside. Some of the structures took advantage of more modern materials such as corrugated steel and plywood walls. I was surprised to learn later that timber and wooden building items such as siding were unaffordable despite the indigenous forests around us. On the roadside, there were wooden stalls with a shade built over them, where few villagers sold items like pawpaws, bananas, bread fruit, betelnuts, some canned foods and ramen noodles.